The party will begin at the Green Bank and Maria Bonita, then work east toward Hulls, across the street to the businesses on the south side and finally end at Dunns Attic. We'll have a great Irish band, green beer, raffle prizes and more. Please come and help us support our downtown businesses. Though we pass by their storefronts almost every day, we often don't have time to stop in, meet the merchants and find out what they have to offer. Tickets are only $10 each and can be purchased on arrival. 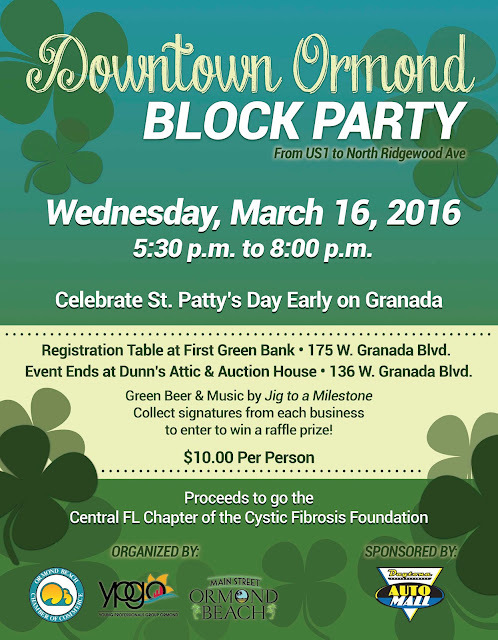 Proceeds for the event will go to the Central Florida Chapter of the Cystic Fibrosis Foundation.